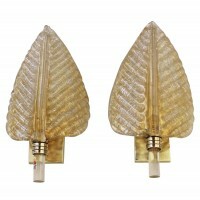 Pair of Murano gold infused glass wall sconces in plume or leaf form manufactured by Barovier & Toso. Reverse side of the glass in the “Rugiadoso” technique with scattered fine particles of glass which diffuses light to a more even glow. Each glass leaf is suspended on 2.75″ X 4.5″ brass backplates. Newly wired. Each sconce uses 1 – 40 watt max candelabra base bulb.